This 4500mAh H450 Large Capacity Variable Voltage Battery is the one for you if you are in search of a powerful, sturdy battery that has the capacity to allow you to vape for what seems like days. In actuality, you should get approximately 30 hours of vape time with this bad boy. Taking into consideration that you probably vape for a few minutes an hour, for approx. 12-15 hours a day, this battery should typically last you several days before you need to charge it up. As well as having impressive battery strength, it also has a variable voltage feature. This means that you are able to adjust the voltage to accommodate the clearomizer, type of e-liquid and your personal preferences. This customizes your experience and makes this battery a top choice for vapers everywhere. There are three voltage settings for this battery: 3.2v. Purple light: 3.7v. Blue light: 4.2v. This battery comes in three great colors: red, black and grey. It also is 510 eGo threaded. 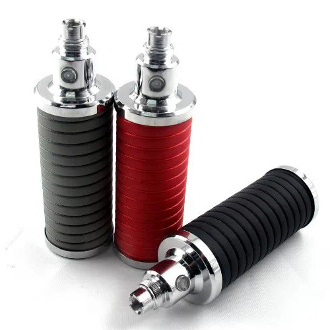 This means that it will work with any 510 eGo threaded clearomizer or atomizer. Check to make sure the clearomizer you are using can withstand higher voltages before using at a higher setting to prevent damage to the clearomizer. Keep in mind that this battery is a big one; a little over an inch in diameter and just under 4 inches tall. It's not a pocket vape. **Charge your battery initially for 8 hours to set the battery memory. From that point on, only charge the battery for up to 5 hours at a time. **Overcharging your battery can (most likely will) cause irreparable damage. IE. Not holding a charge, burning out your clearomizer wicks, not functioning at all. REMEMBER: NEVER LEAVE YOUR BATTERY UNATTENDED WHEN CHARGING. To turn ON, press the button rapidly 5 times. To change the voltage, press the button rapidly to cycle through the voltage settings: Red light: 3.2V. Purple light: 3.7V. Blue light: 4.2V. To turn OFF, press the button rapidly 5 times again.